College Forward coaches underserved, motivated students to achieve the benefits of higher education and a college degree. CSI provides College Forward (CoFo) with the unique opportunity to connect directly with nonprofits to better understand the problems they aim to solve and to learn how our missions intersect. We are excited to continue to grow as an organization at our new home, and contribute energy and resources to the impact ecosystem. For 15 years, College Forward has provided our college access and completion coaching program to more than 8,000 students in Texas. Our coaching services-- as delivered through our College Access and College Completion program-- pairs low-income and/or first-generation students with Coaches who deliver individualized academic, financial, and socio-emotional support and critical interventions. College Forward begins our intervention with our College Access program participants: motivated underserved students recruited as juniors. Students must be in the top 60% of their class and must be low-income (determined by qualification for the National School Lunch Program) or the first in their family to graduate from college. From the spring semester of their junior year through the spring semester of their 12th grade year, College Access Coaches draw on College Forward’s extensive college access curriculum, to guide students through such college-readiness and exploration topics as selection of ‘best match school’, standardized test prep and motivation on test day, scholarship and college applications, financial aid applications, and preparation for success on campus. Additionally, Coaches coordinate bilingual (Spanish/English) parent education workshops geared towards empowering families to embrace the knowledge and resources they need to support their child in the college-going process. College Forward’s real differentiator is the continuity of services we provide to help students persist and graduate through our College Completion program. From graduating from a Texas high school through degree completion (6+ years,) our College Completion program pairs students with College Completion Coaches who help students in making informed decisions about their educational paths such as transferring from a 2-year to 4-year college, finding and applying for financial aid, and developing the time-management and study skills necessary for college success. Coaches leverage social media, phone calls, and periodic in-person campus visits, to provide College Forward’s interventions to students. As part of this program, Coaches support college students as they persist and earn a certificate or degree from the higher education institution of their choice, including local institutions such as UT-Austin, Texas State University, and Austin Community College. 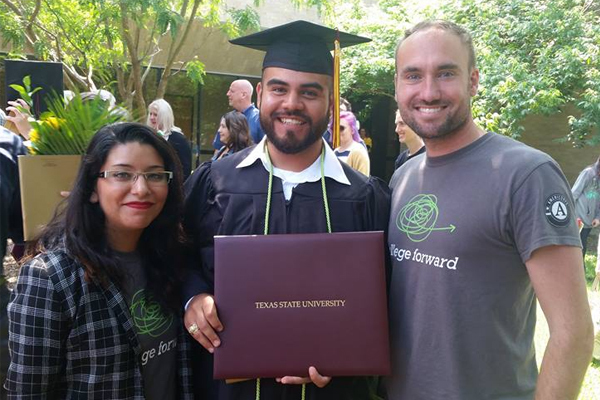 College Forward provides intensive, hands-on mentoring that has yielded dramatic increases in college access and success among underserved students. College Forward’s successful approach to facilitating K-12 to higher education enrollment is in high demand, fueling growth from 30 to more than 12,000 students today. While considerable for a young nonprofit, relative to the size and intractability of the problem, this growth is insignificant--there are over 24 million disadvantaged students currently enrolled in U.S. public education. While our programming initiatives have seen an incredible amount of success, College Forward continues to seek ways to innovate and improve the way we serve students and increase the number of students we reach. We are currently pursuing ways to diversify and share our student success services and connect our student's voices to the lawmaking that governs higher ed. Congressman Lloyd Doggett of Austin recently authored a bill to simplify the Free Application for Federal Student Aid (FAFSA) based on our recommendations, and it has become one of his most heavily sponsored pieces of legislation. In addition, we're piloting two program delivery approaches allowing us to reach high school and college students across Central Texas beyond our traditional programming; one based on the work-study model using collegians as quarter time Coaches, and another delivering coaching services outside of direct high school program enrollment. This year, we are also implementing a revolutionary peer-to-peer mentoring mobile application that will soon allow College Forward Coaches, staff, and students to work together to realize vulnerable student higher education ambitions in ways previously only imagined. Success Partnerships: In 2014, College Forward became the first nonprofit in the U.S. to collaborate directly with colleges to enhance student success. Our campus-based student mentoring services increase persistence and graduation rates for a college’s vulnerable students. Success Partnerships has delivered College Forward’s coaching services to more than 3,000 students at six post-secondary institutions across Texas. CoPilot: In 2013, a database created to meet internal program management needs, was made available for licensing. Six organizations signed up within a month and demand has never abated. CoPilot has allowed College Forward (and over 40 partner organizations across the nation to date) to identify and harness student information in ways that continually inform our ability to be highly responsive to student needs. License-based fees from this initiative have provided our organization with a steady, ever-increasing flow of unrestricted earned income funds. Policy Work: Because student-focused legislation has the greatest potential for broad, long-lasting change, College Forward is engaging in state and federal advocacy to bring the perspective of underserved students to lawmakers who govern college access and success. College Forward owes our success to dedicated leadership, talented staff, a willingness and desire to be innovative, and strong organizational partnerships. Cultivating these elements within a nonprofit organization is a good way to advance your mission.